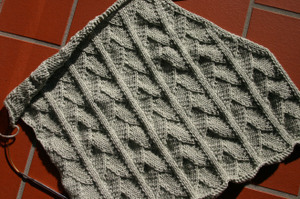 Not much action on my Wyvern Wrap lately, and here is the reason: (see swatch). I had ordered a couple of different colors of RYC Cashsoft DK once I realized I was going to run out of the Trilly, without being quite sure what I was going to do with them. I didn't want to start over with a different yarn, nor start over just so I could insert a contrasting or coordinating yarn at the lower hem (which is where it most logically belongs, if you ask me...but oh well). Nor can I put the new yarn on the ends of the sleeves since they're worked sideways in one piece with the body. I also didn't want to add the new colors to the fronts because I want to be able to take photos of the finished wrap for the pattern, without the distraction of multiple colors. So this left working the new color(s) into the back somehow, probably in some sort of stripe. 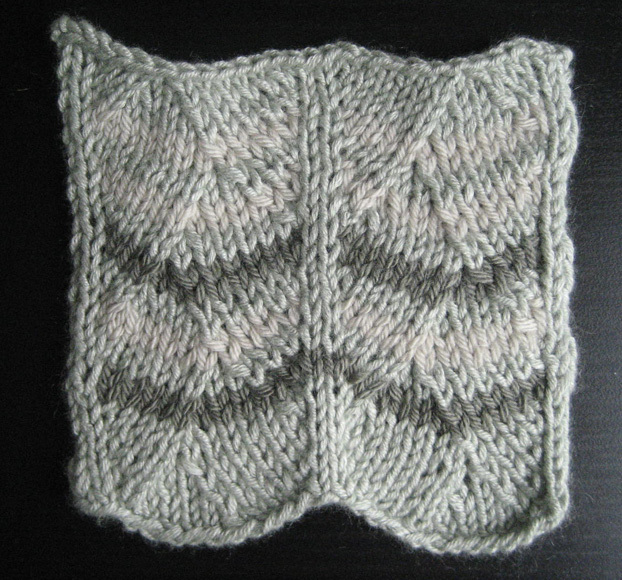 And now that I've begun working on the back, it's time to create a more specific plan (in other words, swatch time). 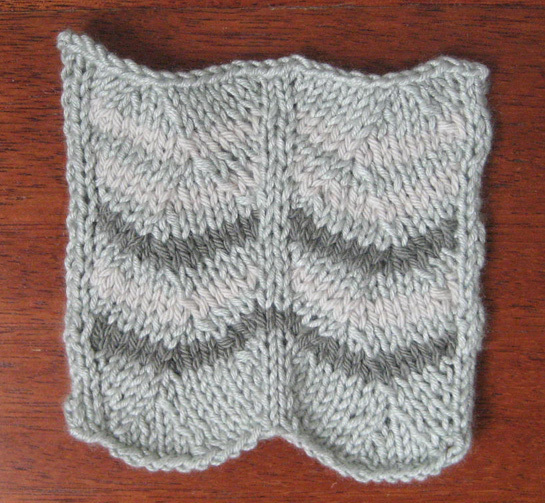 When I started the swatch I realized that if I didn't want the yarn visible at the sleeve ends (since they are self-finished), I would have to keep the first and last two stitches in each row in the main color, which required either using a separate piece of yarn on one end, or stranding the main color--which is why partway up the swatch I started doing the stockinette column in the middle in the main color. I actually like the general effect a lot (for some reason it reminds me of a close-up of a butterfly's wing), and I like the curving of the stripes, but the cream color is too similar in tone to the main color, and the sage color is too dark--the stripes are more pronounced than I want. Both photos are of the same swatch, by the way. 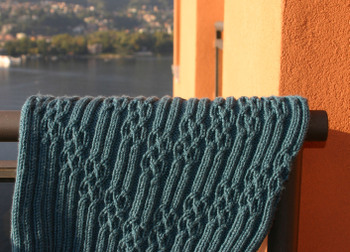 So--I am waiting for more yarn in different colors. This is turning out to be more complicated than I would have liked. Now that I've completed several deadline projects, I can get back to work on Wyvern. I've finished both fronts and joined them to start on the back. I finished the right front first and blocked it to make sure my gauge was on, before I started the left front; as you can see, the blocked right front piece is noticeably bigger than the unblocked left front piece. 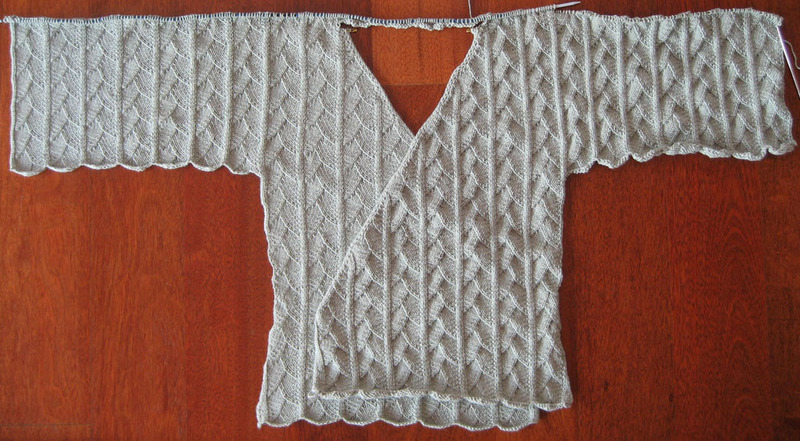 It's slow going on the sleeves/back combination: those are long rows to hoe knit! Plus, I have to decide just how I'm going to work stripes of coordinating color into the mix; I'm quite sure that I don't have enough yarn to finish with the Trilly alone. It will help keep me going, knowing from experience that the lower back, after the sleeve stitches are bound off, seems to fly off the needles. 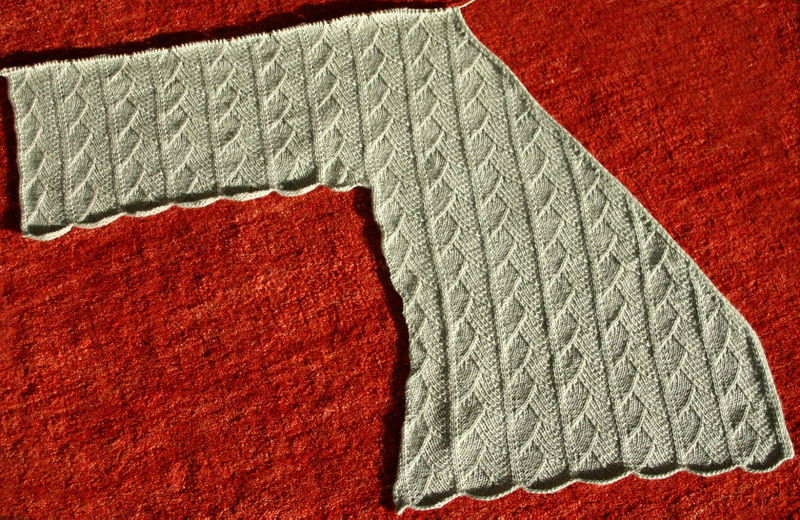 The right front of my Wyvern Wrap (size small) has been growing at a good clip; I'm almost finished with the side shaping increases, and soon will cast on stitches for the right sleeve. I'm having a nagging fear that the sleeve, which is essentially a drop sleeve, may end up being too snug for this style, at a circumference of 13 1/2 inches for my size. 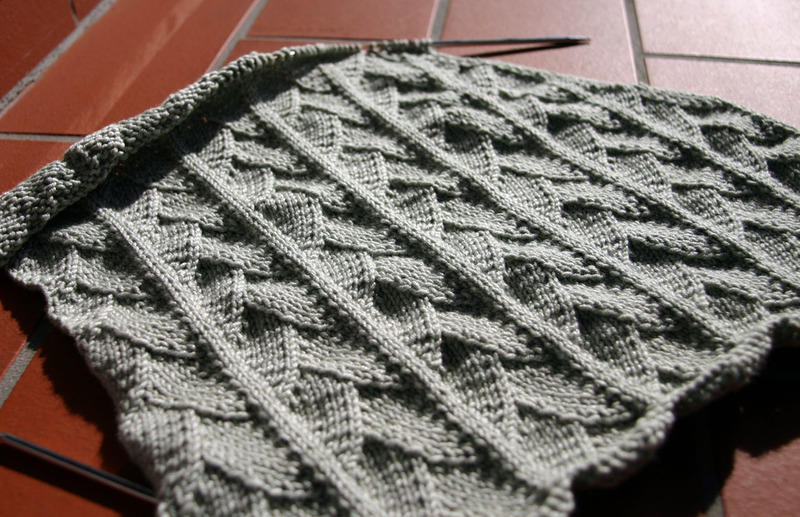 I think this fear will be best addressed by knitting a little farther, so I can see how the sleeve looks and feels. I went into my stash for the yarn: Filatura di Crosa "Trilly," 50% silk and 50% cashmere, which swatched for me at the same gauge as the Kollage Yarns "Yummy" (merino and silk) called for in the pattern. 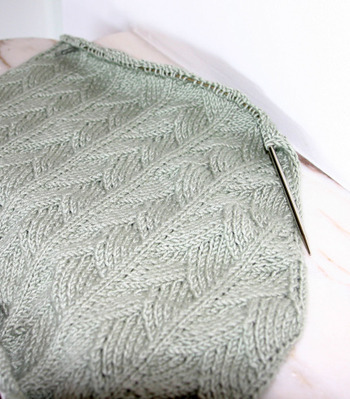 The Trilly has a nice tight twist--not the slightest bit of pilling or fuzzing, at least so far--and a silvery green color which reminds me of the leaves of an olive tree--beautiful. I love the texture of the unblocked fabric, but the wrap isn't going to fit me if I leave it that way! 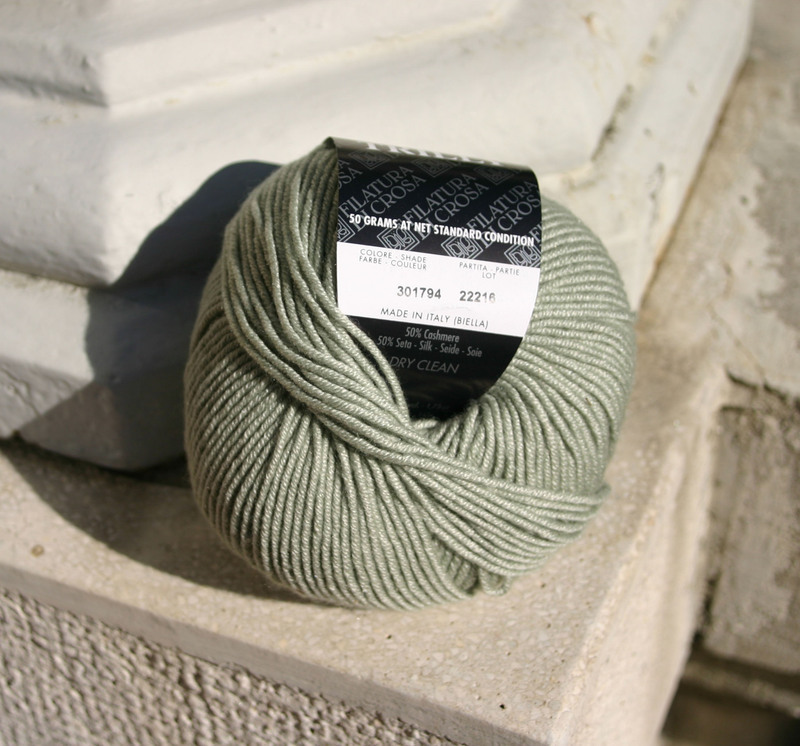 I know it's a cheap trick to recycle old posts as new, but hopefully I'll soon be done swatching with this yarn so I can post a photo or two, and the Debbie Bliss Cashmerino I ordered from Angel Yarns for my adult Sherwood is en route!